Most of the affiliate links below will generate a type of donated compensation for HAAL based on your activity (signing up and/or making a purchase), and some may offer discounts or bonuses for you! New to Chewy? Shop and we get $20 for your first purchase. Perk for you - get 20% off your first autoship. Join Ebates and Earn Cash! If you sign up for Ebates through this referral link you will receive a $10 bonus after your first purchase and we will get a referral bonus. Use smile.amazon.com every time you shop on Amazon and we will receive 0.5% of your eligible purchase as a donation from Amazon. We have our most important necessities on this wish list. If you access the list once you're logged into Amazon Smile, you'll amp up your donation! 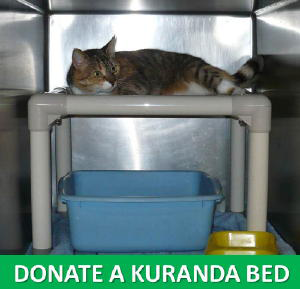 These beds make our cat's habitats so comfy! Donating through this link will give to access to special pricing. We love Imperial Cat's line of cat scratchers. They are great enrichment tools for our cats - it keeps them happy and healthy! If you donate scratchers through this link you will receive special highly discounted pricing. We will receive 5% of your purchase total! Choose Homeless Animal Adoption League at checkout. ​Pet Treater will donate $7 to HAAL with your subscription. ​Use coupon code: HAAL15 to save 15% on your first box. 5% of the proceeds are donated to HAAL. If you sign up and shop through iGive we will receive referral bonuses. BISSELL will donate a portion your your pet product purchase. Host a food & toy drive at your school, workplace, or home. Stop in to HAAL and spend time playing with the cats. When it's time to celebrate a birthday, anniversary, or other event ask that your attendees bring a gift for shelter animals instead of buying a present for you. Host a bake sale with proceeds going to shelter animals. Have a lot of junk to get rid of? Have a yard sale and let the attendees know the proceeds are going to a shelter, which will encourage more people to make a purchase. It's a win/win!